who breathes life into this humbled shell of flesh. I stand alone surrounded by beauty. With a cleansed soul I hear the pines whisper, and the brooks laugh. I am in awe of all your creations. on which you see me fit to stand upon. Their Bapeewug, laughter fills the air and my heart. with cloudless eyes and pure of heart. for all that you have unselfishly given to me. 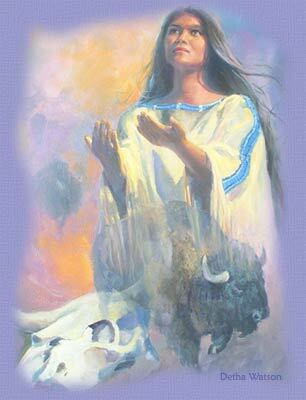 Bless me so that my Manitouwabi, spirit, stays strong. Guide me along the right Mekanayzn, path. I shall meet you face to face. I am but a humbled Ojibwe Anishinabe, Indian. Music: "Maiden Of The Wood"